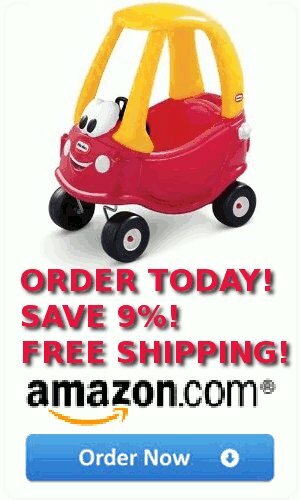 Little Tikes Cozy Coupe 30th Anniversary Edition was released this summer. These amazing child powered cars have been a hit with parents and children for the past 30 years. All of my Grandchildren have had a least one of them and of course one lives at Grandma’s house for those special visits. For several years we have attended â€œRoaming Rascalsâ€ at our local recreation center, where there are several of these cars available and very popular. I like them, as the roof is high enough that pushing is easier on the back than some other â€œride ‘m toysâ€. The Little Tikes Cozy Coupe 30th Anniversary Edition has a removable floorboard. This allows for safe easy parent (grandparent) pushing of a toddler that has not yet reach the stage of using their feet to push the car. It also comes with a cut out area at the back of the roof for parents to use as a handle to push upon. I must say it my experience these cars are easy to push by just placing your hands on the roof. For the children the new cozy coupes have lovely smiling faces, high back seats, storage area at the back, and a driver’s door that opens and closes. This makes a perfect Christmas gift for a child eighteen months to age four.